The delayed redevelopment of Aberdeen's historic Union Terrace Gardens is expected to run further over time. Plans to transform the Victorian sunken gardens were approved in March last year. 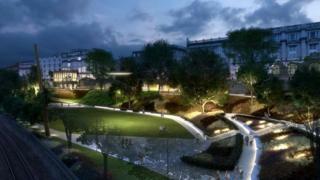 The proposals - expected to cost £25m - include new walkways, an amphitheatre and a cafe. The original plans three years ago had a cost £20m, with an autumn 2019 deadline. It is understood a summer 2021 date is now being suggested. Due to an extended tendering process, a contractor has still yet to be appointed. Aberdeen City Council's opposition SNP group recently called for the redevelopment to be scrapped.